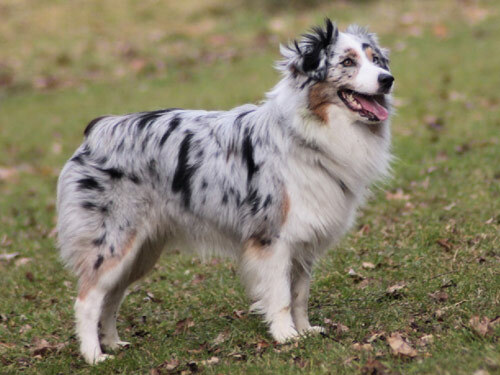 Color(s): Blue merle, black, red merle and all red with or without white markings and/or tan points. Directly developed from the Australian Shepherd, the Miniature is a relatively new breed. Originating in the United States, the Miniature Australian Shepherd is rapidly becoming popular for their compact size and strong work ethic. They are extremely adept at herding, but are not yet recognized by the American Kennel Club. Commonly referred to as the Mini Aussie, this breed is sturdy, hardy, and medium sized. They are well balanced, extremely agile, and possess strength and stamina. Exceedingly versatile, this breed is highly intelligent, an exceptional companion, and a talented farm worker and guardian. The Miniature Australian Shepherd is loyal, affectionate, and easy going. They are lively, playful, and alert. They are deeply devoted and naturally protective. This breed gets along well with older children. Their exuberance and herding instincts make them unsuitable for homes with young children. They are wary and suspicious of strangers and will warn their family of danger or unusual noises. They are typically not aggressive to other dogs. This breed is relatively easy to groom. Occasional brushing with a firm bristle brush will suffice. Bathing should only be done when necessary. The Miniature Australian Shepherd is prone to blindness, deafness, eye disorders, hip dysplasia, and luxating patella. The Miniature Australian Shepherd is a double coat breed. The weather resistant outer coat is moderate in length and is straight to slightly wavy. The under coat is short and dense. The hair on the head, front of forelegs, and outside of ears is short and smooth. The hair on the back of the forelegs is feathered. The coat comes in such colors as red or blue merle and black or red tri-color; all have tan or white markings. The Miniature Australian Shepherd is an average shedder. Early socialization and obedience are necessary and beneficial for the Miniature Australian Shepherd. They are quick to learn and easy to train. They will not respond to harsh or heavy-handed methods. This breed does best with firmness, fairness, reward, consistency, and positive reinforcement. They excel in agility, conformation, fly-ball, Frisbee, herding, and as a therapy dog. Miniature Australian Shepherds require a lot of exercise and stimulation. They thrive on being given a job to do. The Miniature Australian Shepherd is easily bored and will become high-strung and destructive if left alone for an extended period of time without proper exercise. They enjoy family play sessions, long walks, and a securely fenced yard to romp and run in freely. They will do okay in an apartment dwelling provided they are sufficiently exercised and entertained.